Here is an interview of Juliette chatting with The House Whisperer. hi there. you can order the ebook with any email address just click the buy it now button and will take you to a paypal page. Any problems let me know. I have updated my mailing list but to follow on here you will need to unfollow with old address and follow with new one.. i can’t control that bit i am afraid. We will be back in the uk mid april but then off in may to new york running workshops.. I have a week long retreat in june in glastonbury a detox one which will be amazing and will keep you posted on any raw cacao ones. You weeks ago now. But still havnt received it! What shal I do? Hi Juliette, I met you yesterday in The Netherlands and googled you this morning. 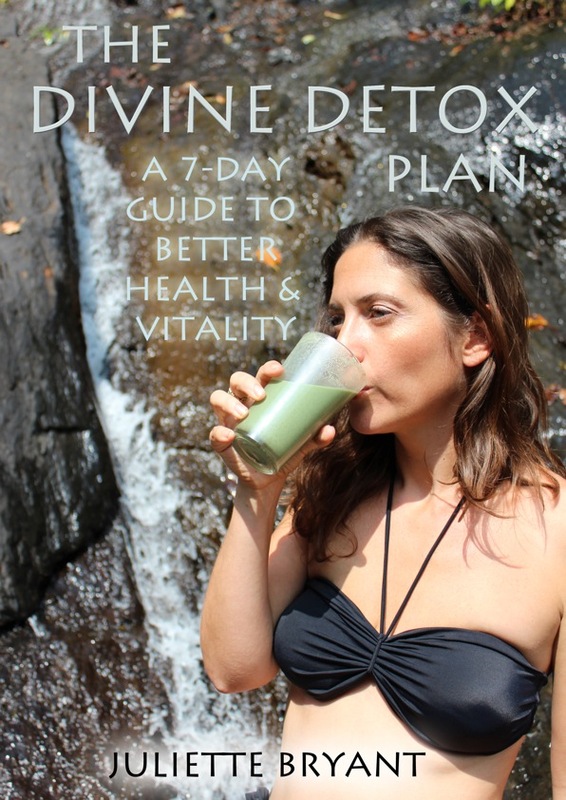 Congrats on your website and the detox-Ebook, which I ordered forthwith. All the best for you and the family during your stay in New York and California. Hi Julliette. Congratulations on your new book; Divine desserts. Please could we have a sneak preview of a couple of the recipes as I’m not sure I will have most of the ingredients required. It may be out of my league! Thank you!!! How do I register for the webinar on on the 8th Sept please? Hi Juliette, Thanks for a great talk last night in Letchworth, it was very inspiring and yes I am going to try oil pulling… Here is the link to our website: http://www.mcs-aware.org (the Charity for Environmental Illness) and if you can email me I will forward our latest magazine for you to have a look at. I came to your talk in Letchworth on 7th Nov. Really enjoyed it, however the ‘coffee’ that was passed out to be sampled, and then was on sale afterwards were not the same. I loved the taste of the one we all sampled and I really dislike the one you sold to me. My mother also came along and feels the same. They were two different things and I think you should have made us aware of that. If you added ingredients to the sample drink would you be kind enough to let me know what they were? I know the sample coffee has cinnamon in it for example. Otherwise could you let me know how we can send them back for a refund. Hi Juliette, I attended the Gathering of the minds event yesterday and purchased a jar of Pure Himalayan Shilajit, but as I tried to get a pea size from the jar the contents are rock hard, is the normal? Hi the supergreen mix is in my shop- it contains wheatgrass, blue green algae, chlorella, marine phytoplankton, medicinal mushrooms, goji, camu camu, vanilla and more. Hi Re order #211 20th Feb.